Amercoat 861 Accelerator can be used for low-temperature curing. Amercoat 68HS is a shop primer for bare steel on new construction or major repair projects, and as a field maintenance primer over bare steel or steel coated with organic or inorganic zinc primers and epoxy topcoats such as, Amercoat 385, Amerlock® 400 or AmershieldTM. 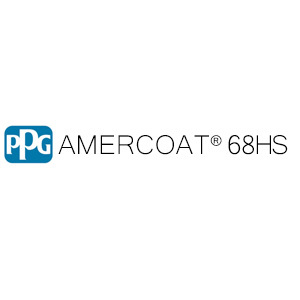 Amercoat 68HS may be used to repair itself or inorganic zinc primers. Coating performance, in general, is proportional to the degree of surface preparation. Surface must be clean, dry and free of all contaminants. Read each component’s material safety data sheet before mixing. Mixed material has hazards of each component. Safety precautions must be strictly followed during storage, handling and use. Ameron warrants its products to be free from defects in material and workmanship. Ameron’s sole obligation and Buyer’s exclusive remedy in connection with the products shall be limited, at Ameron’s option, to either replacement of products not conforming to this Warranty or credit to Buyer’s account in the invoiced amount of the nonconforming products. Any claim under this Warranty must be made by Buyer to Ameron in writing within five (5) days of Buyer’s discovery of the claimed defect, but in no event later than the expiration of the applicable shelf life, or one year from the delivery date, whichever is earlier. Buyer’s failure to notify Ameron of such nonconformance as required herein shall bar Buyer from recovery under this Warranty. Ameron makes no other warranties concerning the product. No other warranties, whether express, implied, or statutory, such as warranties of merchantability or fitness for a particular purpose, shall apply. In no event shall Ameron be liable for consequential or incidental damages. Any recommendation or suggestion relating to the use of the products made by Ameron, whether in its technical literature, or in response to specific inquiry, or otherwise, is based on data believed to be reliable; however, the products and information are intended for use by Buyers having requisite skill and knowhow in the industry, and therefore it is for Buyer to satisfy itself of the suitability of the products for its own particular use and it shall be deemed that Buyer has done so, at its sole discretion and risk. Variation in environment, changes in procedures of use, or extrapolation of data may cause unsatisfactory results. Surface temperatures must be 5°F (3°C) above the dew point to prevent condensation. Quality Management District’s Rule 102 or equivalent regulations. claim. In no event shall Ameron be liable for consequential or incidental damages.